It's been a deadly year for manatees, but Florida Fish and Wildlife believes there are more of them in our waters than previously thought. FLORIDA -- It's been a deadly year for manatees, but Florida Fish and Wildlife believes there are more of them in our waters than previously thought. 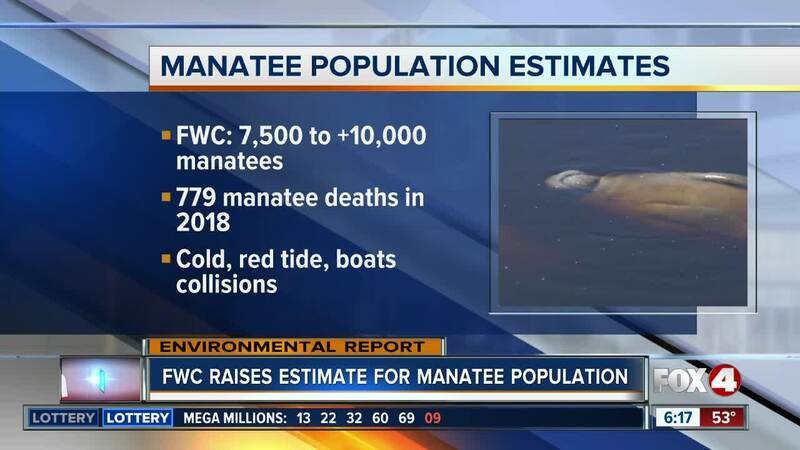 In a report released this week, FWC says roughly 7,500 to more than 10,000 manatees swim in state waters, according to their latest updated survey. However, wildlife officials say there have been 779 manatee deaths so far this year. Experts blame a winter cold snap, prolonged red tide, and boat collisions. The detailed report can be found HERE . FOX 4 is launching a special project focusing on the environmental issues affecting Southwest Florida. The goal is to bring awareness to the crisis and search for solutions.